Roasting is a kind of typical key section during food processing, roasting dries raw material further or cause them to turnbrown color, after roasting, nuts are prepared for packaging and sell, for blanching, for making paste & butter, for making coated snacks, candies, etc. 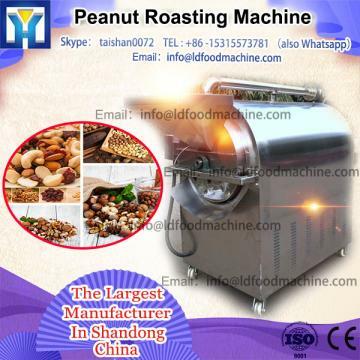 Roasting Peanut Machine Machine is mainly used for baking peanuts, groundnut, sunflower seeds, horse beans, almonds, walnuts, pistachios, pine nuts and any grain type food. Drum Peanut Roaster uses natural gas as heating resource, hot air as medium, utilizes the heat radiation principle to work on the drum directly, There is installed the reducer on back of roaster to drive the drum rotating, there also has special screw plate inside of drum to push the peanut forward and backward evenly, thus cause the peanut roasted equally. The working temperature and time could be set on request. As a pioneer in the manufacture of Peanut Processing Machinery, we dedicate to design, manufacture Peanut Sheller, Peanut De huller, Peanut De stoner, Peanut Sieving Machine, Peanut Color Sorter, Peanut Roaster, Peanut Blancher, Split Nut Blancher, Peanut Coater, Peanut Fryer, Peanut Chopper, Peanut Slicer, Peanut Powder Mill, Peanut Butter Grinder, Peanut Butter Cooler and all kinds of assistant Conveyors, our machinery have been applied for processing Peanuts, Sunflower Seeds, Pumpkin Seeds, Cashew Nut, Horse Beans, Almonds, Walnuts, Hazelnut Pistachios, Pine Nuts, Pistachios and dried fruits. With tens of years development, our peanut processing plants, such as Peanut Shelling & Sieving Line, Peanut Roasting Line, Peanut Blanching Line, Peanut Chopping Line, Peanut Coating Line, Peanut Frying Line, Peanut Butter Line, Slated Inshell Peanut Line are installed and run in customer’s company successfully, effective and lasting quality help us to create a deep impression both domestically and internationally. Our machinery occupies more than 85% in domestic market, are exported to more than 30 countries.